Agbodjelou is one of the pre-eminent photographers of the Republic of Benin, based in the capital Porto Novo. 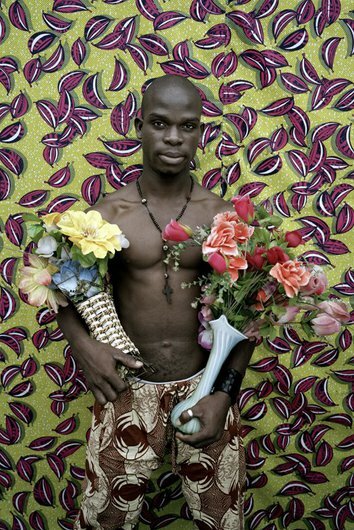 Trained by his father, the world-renowned photographer Joseph Moise Agbodjelou (1912-2000), he has since developed his own individual style in contemporary and innovative ways. His new Demoiselles series delves deeper into his on-going portraiture project entitled ‘Citizens of Porto Novo’. Using a daylight studio on location and shooting 6 × 9 medium format film, this new body of work focuses on the young female citizens of Leonce’s hometown. The grand old colonial house in these images has belonged to Leonce’s family for generations. It was built by the artist’s grandfather – a merchant who made a fortune selling lemonade to the French and Portuguese armies. The mansion was constructed in 1890 by Afro-Brazilian artisans under colonial rule. Benin’s Afro-Brazilian culture stems from the slave trade, a very important part of Benin’s history during which over 12 million slaves left the country’s ports. Today Porto-Novo feels like a city of the past, loaded with faded grandeur and dilapidated interiors. These Portuguese styled colonial buildings tell a visual narrative of Africa and its colonization. Timeless in their construction, the ‘Demoiselles de Porto Novo’ images are both historic and modern. The girls are often bare breasted as traditional village life dictates, wearing ceremonial or Vodun masks. The interiors, with intricate carved woodwork and peeling paint, are alive with the ghosts of the past. Many of the images include old framed portraits of Leonce’s grandfather. The series also raises questions about religious practice in West Africa; one image combines a bare breasted Engungun masked female with a Pentecostal calendar in the background. Leonce’s new work is deeply personal, focusing on Porto Novo, its citizens, a complex history and an unknown future. Leonce is the founder and director of the first photographic school in Benin and has recently been appointed president of the Photographer’s Association of Porto-Novo. Leonce’s work has been exhibited at the Saatchi Gallery, London, and collected by the CAAC Pigozzi Collection, Geneva, and Pitt Rivers Museum, Oxford, among others. Works will be exhibited in the upcoming exhibition ‘Betwixt and Between: Contemporary African Photography’ at the Kelvingrove Art Gallery and Museum, Glasgow.